Welcome to 2015! If the science fiction writers of the past were to be believed, we’d all have hoverboards and teleports and all manner of incredible techtastic by now. Alas, that’s not even close to true, but the dirge of everyday life continues. 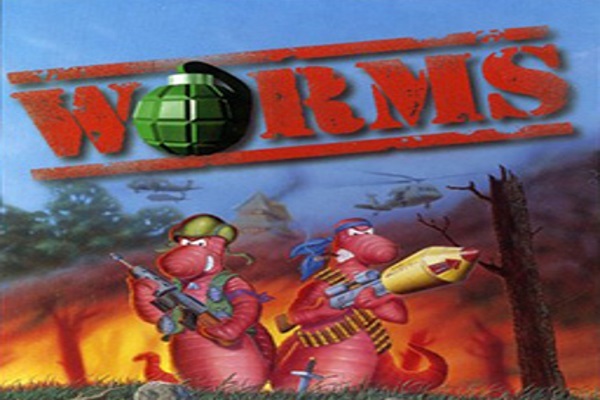 As such, let’s take a look at one thing that 2015 means for video games: the twentieth anniversary of the Worms franchise. Join me as I party like it’s 1995 and take a look back at the first game. This strategy sensation needs no introduction. Naturally. But for the sake of the whole ‘typing words at your face’ thing I’m here for, indulge me for a moment. It’s a turn-based strategy war game, featuring two bands of anthropomorphic worms. Players take turns to move one of their lil’ dudes around the landscape, select a weapon, and use it. Opponents that are hit will lose HP depending on the attack they took, and turns cycle until only one army remains. All of this is conventional enough at first glance. But what Worms does so well is the layer of pure toontastic madness on top. The worms themselves are adorable, as is the ungainly way they ‘hop’ around. The hefty bazookas and blowtorches and such that they wield are also cute in a way that high-powered deathly death weaponry of DEATH should never be. The squeaky soundbites, the visuals, it’s all made to be funny. But don’t go underestimating this one, as there’s a fair amount of strategy involved. You’ll have to size up the most dangerous target, or the best-positioned one. You’ll have to remember what can be done to you in return afterwards, and plan accordingly. You’ll have to choose the best tool for the job, and keep a steady aim. In some cases, the wind will also be a factor to take into account, able to blow rockets and shells off course. 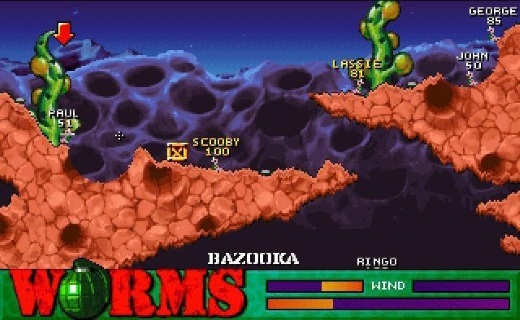 The original installment of Worms was very barebones. Simple single and multiplayer options were all we were given, with precious little customization to speak of. Even so, its randomly-generated environments and placements ensured that no two matches were ever the same, and it was hugely addictive as a result. So much of the familiar formula is unchanged from this inaugural release. That just shows what a winner Team 17 were onto with this one. The series has gone off the rails somewhat since, with the dead horse being flogged so often, but some of that mid-nineties magic remains.